During several years, cropcircles appear in Wylatowo, and lightorbs are sighted. Stefan Zachert is in that very village, and keeps us informed daily, of the most recent information and developpements. We thank Stefan for his information. 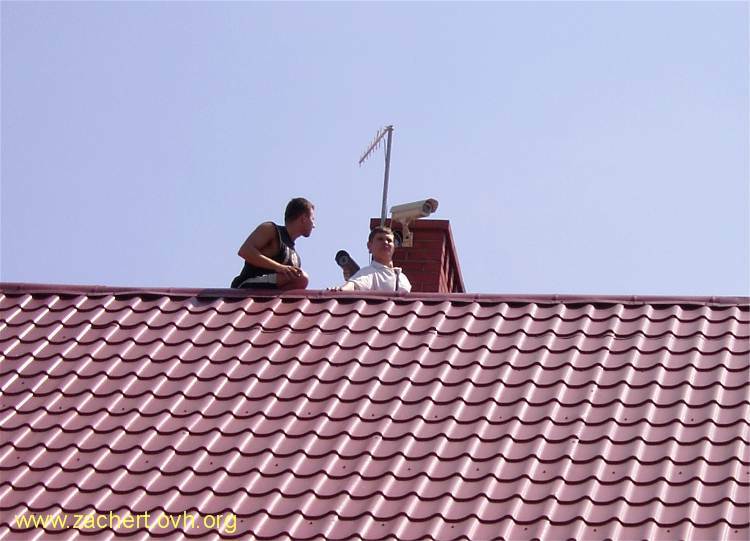 To see live images of the webcams live, click on " Akcja Wylatowo 2006" next click on "obra z kamer" and then on those 2 "serwer" images. 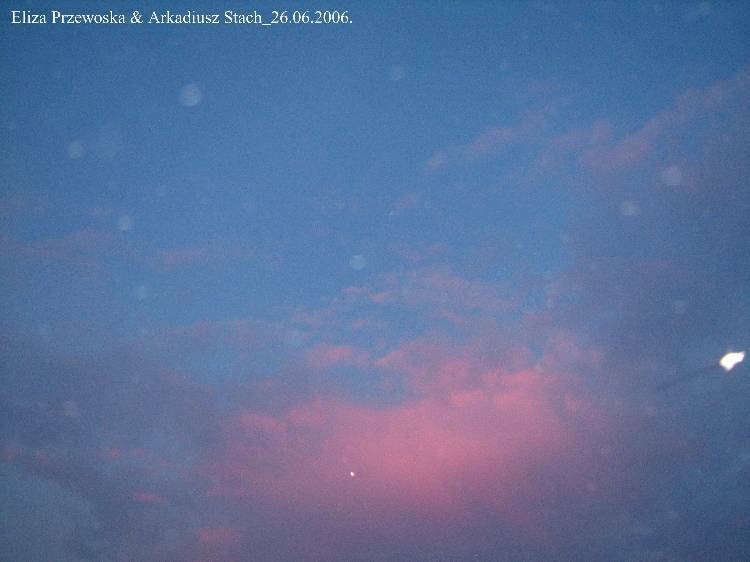 28.07.06 - "Wylatowo - Polen - Juli 2006" We all invite you for the conference, that will bring you all information about the result of UFO reseach, and the monitoring. The conference will take place on 1-8-2006 and starts at 5.00 PM in the fire station. - De voorlopige berichten van Dr. J. Szymanski en Roman Tabaka over de realisatie van het project van magnetische detectie en het uitzenden van radiosignalen in de omgeving. - Een bijdrage van het hoofd van de luchtmacht, J. Makiela, met sensationele informaties over UFO en militaire activiteiten. Aanwezig zullen zijn de TVN, en ook journalisten van andere media. 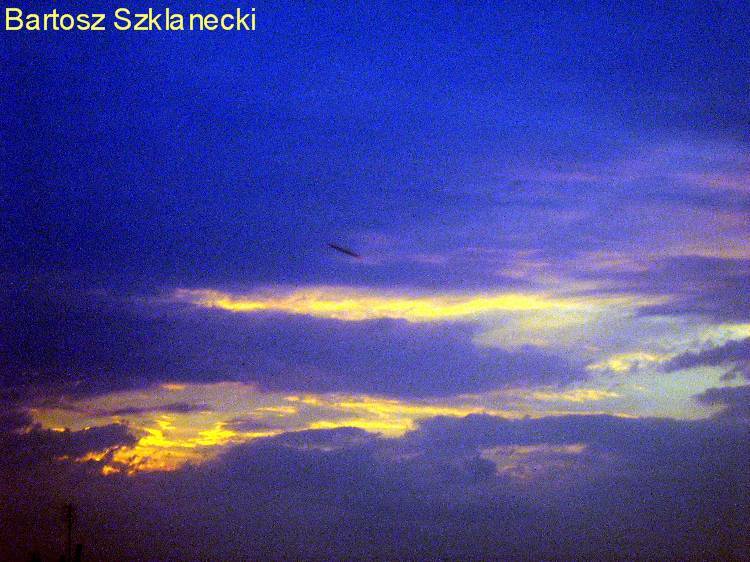 27-07-06 - A UFO at the lake of Wylatowo, photographed without flash by Adrian Witkowski. The broadcasting of 8.00 PM continued, although one of the servers broke down. The first guest was the famous bioenergetic therapist Dr. Henryk Slotkowski. Breaking down the server as a not appreciated incidence, was interpreted as the influence of his bioenergetical energy, for he has experienced it several times in his carreer. The recordings however were just continued, and are available as data on internet. 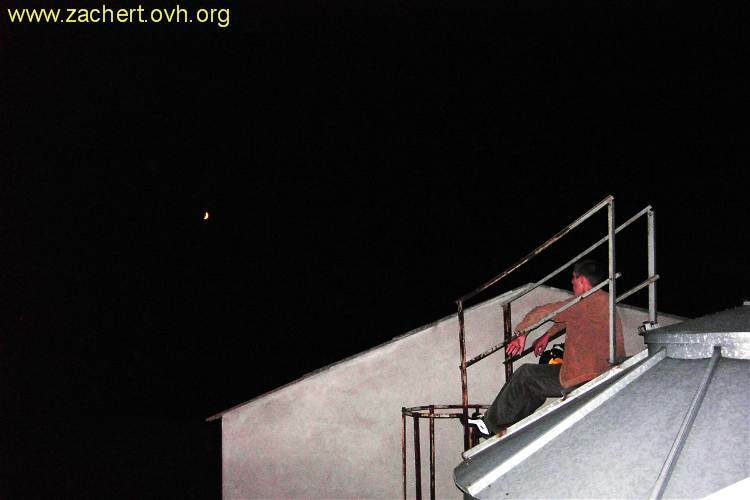 There also was a report of me and Jerzy Spulecki, about a sighting of a very bright lightorb during the last night at about 11.00 PM. A third eyewitness was Martin Harms from the FGK. 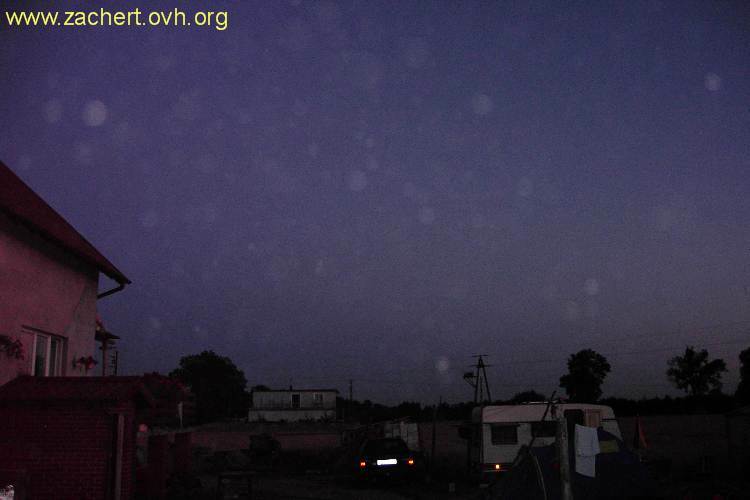 The orb moved into the west direction from our base camp, shrinked and disapeared. 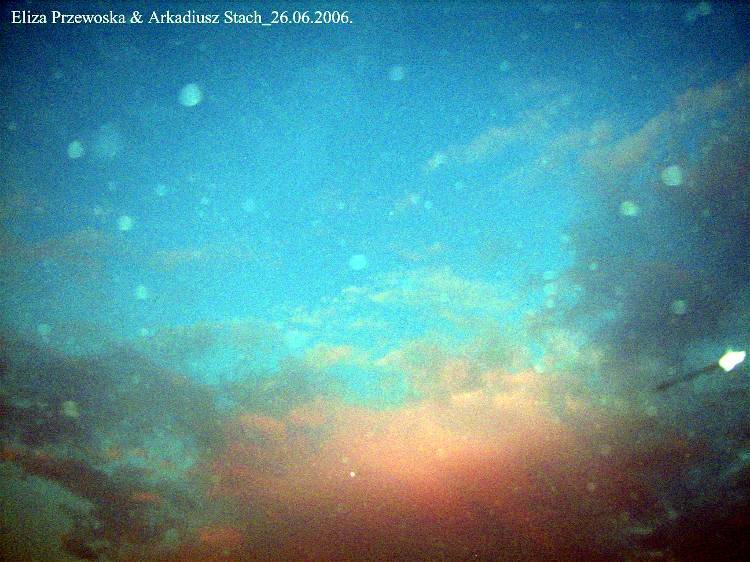 26.07.06 - Photo of Tomasz Cwiek, made in Wylatowo. 25-07-06 - About 6 new people arrived. 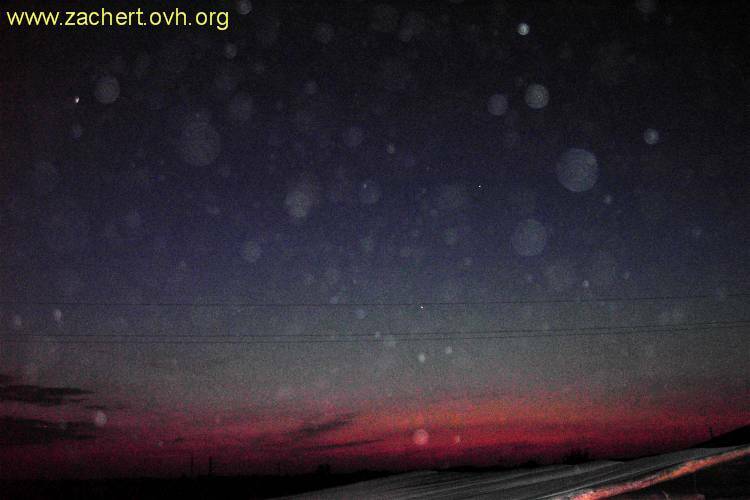 There is an increased orbs activity registered (on photo's). Last night, after a meditation, the just arrived people have sighted a lightflash, and a remarkable sound was to be heard. 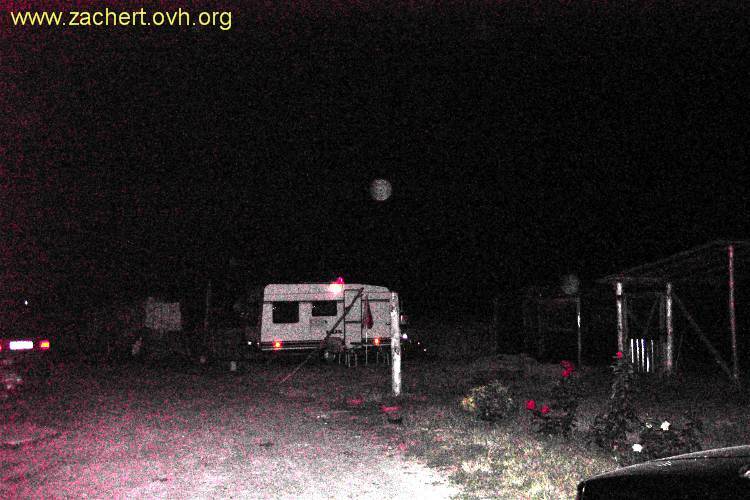 Today, on the cameras of the monitoring system, on more frames taking about that time (2.00 AM) a bright light was to be seen on that very spot. 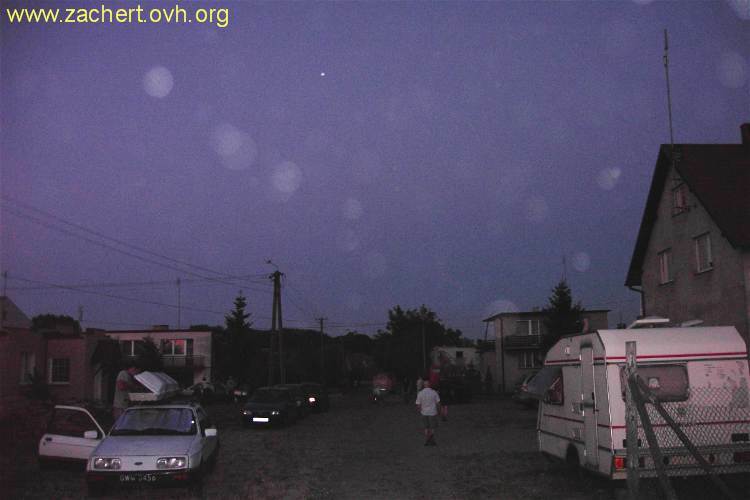 - a presentation of the new UFO photo from Lubian"
22-07-06 - Today 2 campers from Germany arrived. One of Martin Harms of the FGK and his family, the other with his parents. Martin wil stay about 12 days. His parents will be of untill next weekend and than will come back. We've got a nice present of Frank Peters (chairman of the FGK). More volumes of the "FGK Report" and some posters with cropcircles, that I'll spread amongst the researchers. Before this weekend a lot of people arrived. 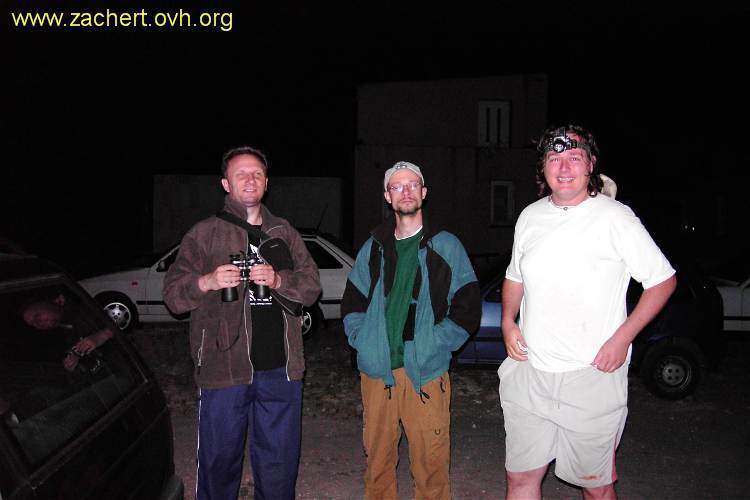 20-07-06 - At 3.04 AM we decided to shut of the monitoring system. 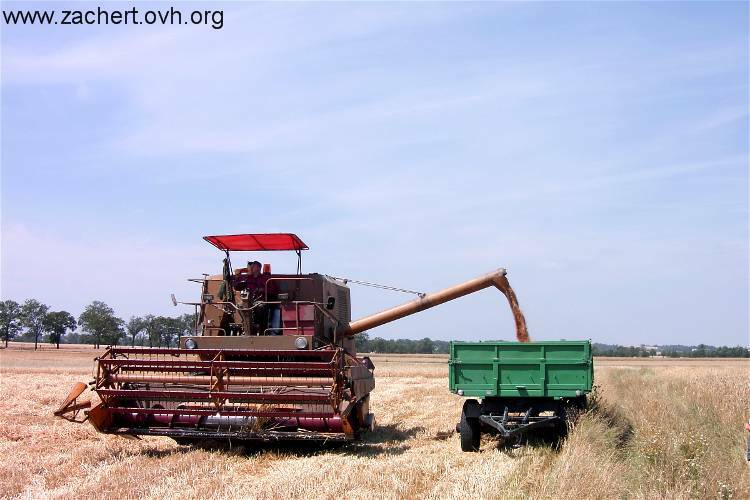 Mr. T. Filipczak annouced he would harvest the field on 20-7. There wasn't that much to loose. Anyway, some people asked to shut of the camera's, at least for a short time, and dat's what happened. at 12.00 noon they were put on again. The temperture is rising daily, and it is very dry. The temperture in my trailer is about 80 F at 11.00 PM, because I need to keep my windows shut because of the insects. 18-07-06 A great fire occurred in the fields on a distance of ca. 4 miles from Wylatowo about 15.00 PM. 10 firebrigades were there and got it under control, with the use of tracktors, and people using hand tools as well. It is very hot last days, and it has been dry for a long time. Today we had a strong wind. This evening Waldemar Czarnetzki arrived. He cooperates with www.ufotv.pl. In the broadcast from 19-07-06, there wil be talked about a lot of issues. Short suvey: The high current cables close to the formation, regularly caused disturbance. About a month ago, the transformator was replaced, however. obviously during the periode the formation was created, there has been some currency outfalls in Chludowo. 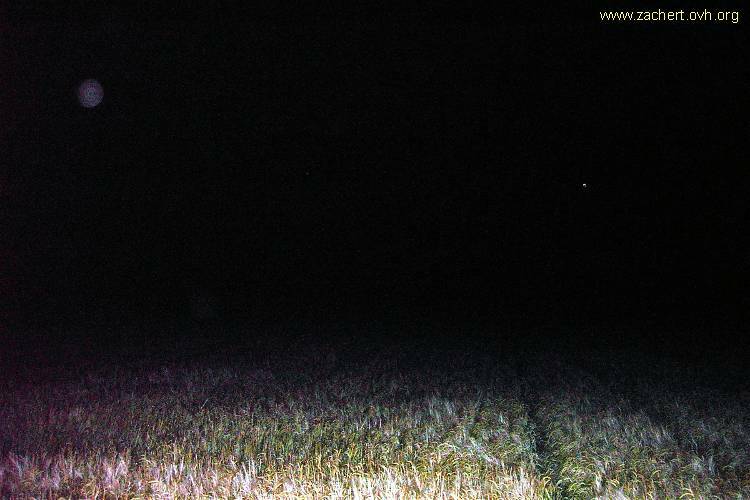 In 2004, there appeared a cropcircle as well, and some light anomalies were to be seen in the air as well. The formation is about 12 m long (About 11 yards long) having the shape of a violin key. Hard to create by men, without any damage to do to other vegatables. This formation is in the report, also by ctitics, regarded as "authentic". 11-07-06 - Unfortunately, there hasn't been a cropcircle in Wylatowo yet, but, there has been an information from Szymon Ciupak, there should be a pictogram found in Chludowo close to Poznan. 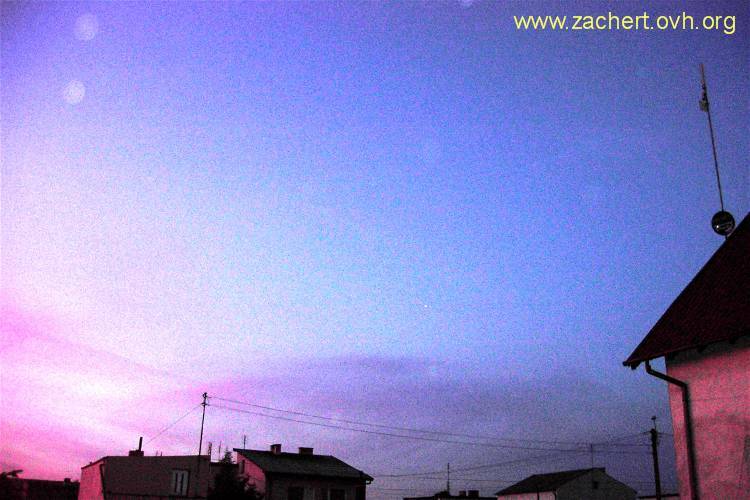 On the website of www.ufotv.pl however, the first photos are available. 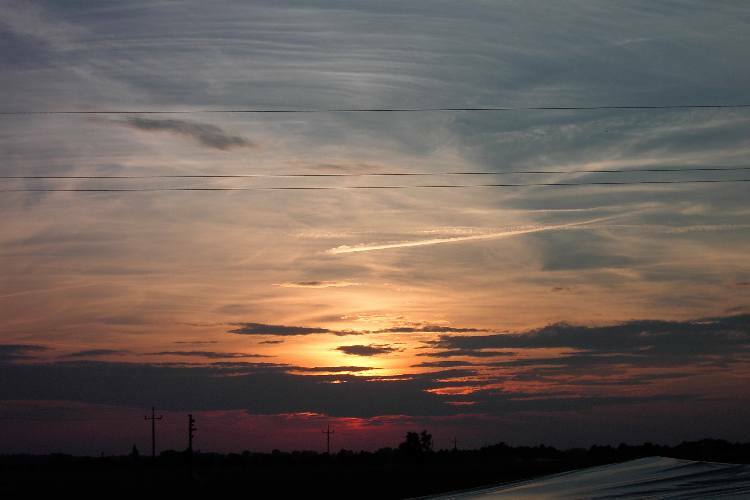 The next information will come from Wloclawek from radio GRA including photos. Unfortunately nothing can be said yet about the authenticity, because the FNC isn't that well equiped in Polan as a whole, as they are in Wylatowo. More information will come later. 09-07-06 - I am in München ( Germany) for 5 days, and traveled to münchen using such a line coach (Bus)Translations of the news I'll continue during the evenings on my laptop, and will post them to Ed Vos from Holland, who will translate them on Dutch and English. Here in the gallery, there also is an access to the materials of the photo analyses of Waldemar Czaarnetzki, and his reconstructions of an object. It concearns one of the objects of 3. The analyses of the other 2 will take some time. 08-07-06 - The ARD, (first German TV broadcast) makes more video's, and will stay longer as planned before. 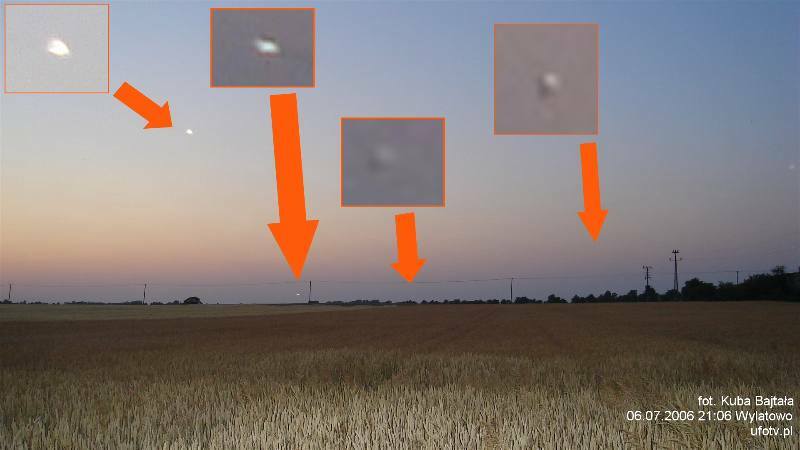 at 20.00 (08.00 PM) there was a special broadcast of the www.ufotv.pl in wich the UFO photo of Rafal Cwiek, wich he made on july 7 th was broadcasted. This photo was posted to Koln (Germany) to Waldemar Czanertzki to have him make some digital analyses. It was a live broadcast in which Waldemar told about the methodes used in digital analyses. Since today, a special contact is possible using the communication program "Skype" (Nickname: ufotv.pl)For that purpose there is an extra computer available during 24 hours to give answers and informations. 07-07-06 - 07-07-06 - Information about the prepairedness of the patrolcar of the FNC ( a VW LT van). Since sunday this car is in Wroclaw, although shortly some repairs had been done on wheels and tyres, they are broke down again, and should be replaced. It's the third mysterical event we experienced with the vehicles. Again a patrol and observations have taken place during the night. This morning at 10.00 (10.00 AM) 3 jet-fighters flew over Wylatowo very low. 11.30 ( 11.30 AM) the temperture now is above 34 degrees celsius (95 degrees Fahrenheit). 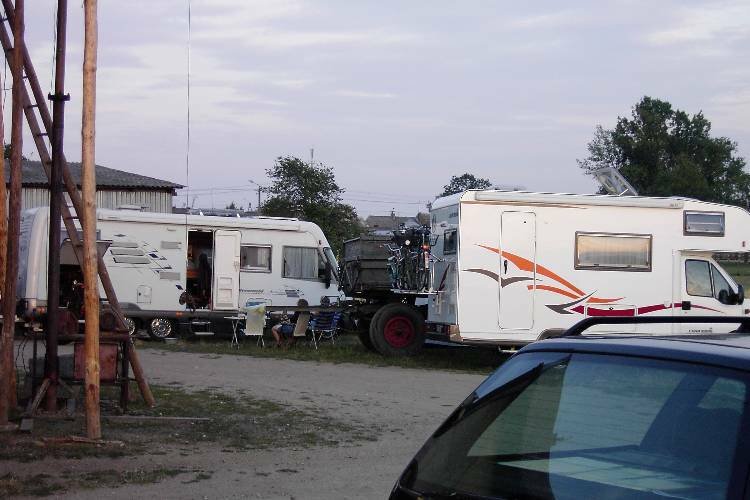 The most important car of UFO-Patrol will be repaired during the night, and will arrive tomorrow in the early morning from Wroclaw into our main base. Janusz Zagorski told me, saturday a team of the ARD (First German broadcast company) will come to Wylatowo. They want to know if someone speaks German. And so, my name was mentioned. 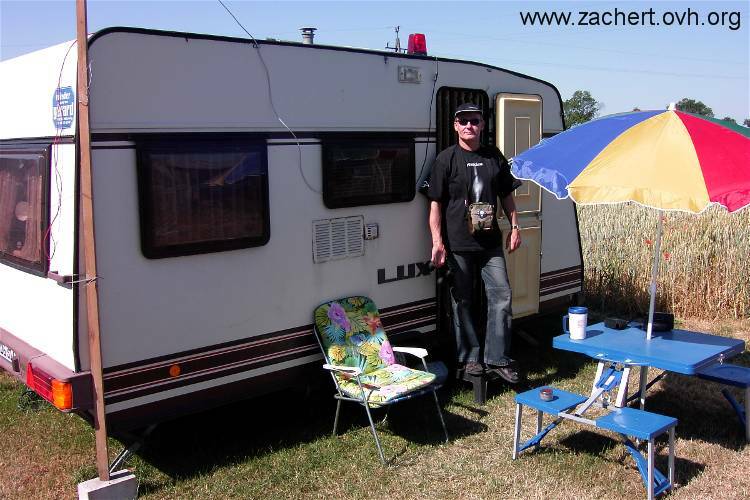 In the mean time more people have arrived at our main base. 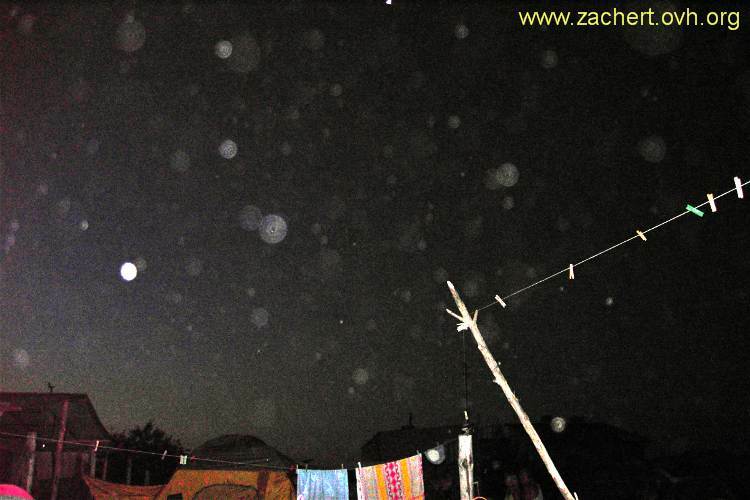 3 of them, made remarkable photos of orbs. for that reason there will be a special broadcasting on saturday 20.00 (8 PM) on www.ufotv.pl (Adittion Ed: They normally don't broadcast during the weekends. 06-07-06 - More eyewithesses reported a flying ball of light over the fields during the night. At this moment a team of the TV program "3" visites us. The team makes interviews, and capture our researchers experiments with broadcast equipment and antennas in the field, on film. 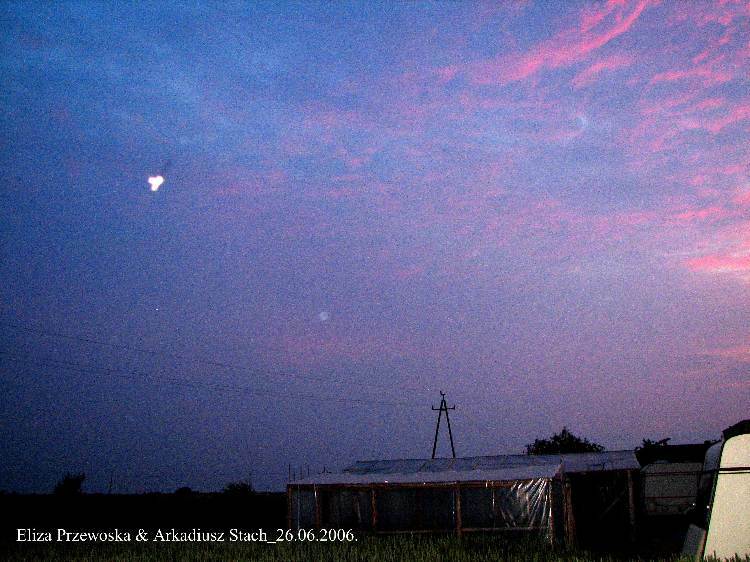 05-07-06 In the evening a military patrol aircraft flies over our base. A team of Polsat-TV joined us and will stay for some time. 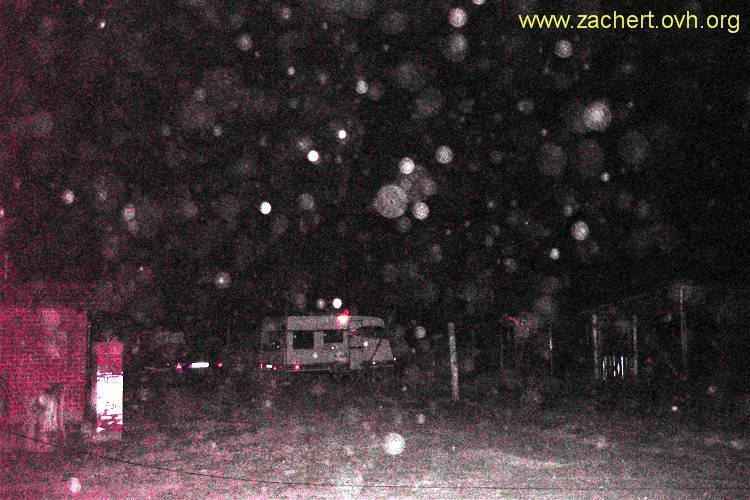 At about 22.30 (10.30 PM) I'm in my caravan (Trailer), as there is a knocking at my door. A colluague tells: "We will start an action with the TV team. Everyone who wants to join can come with us". I fastly grabbed my equipment. Some went by 2 cars, others by feet, to explore the surroundings. For that purpose we split into several groups, to take photos in the dark, do observations, and used our flashlights. Someone told us, another strong signal was broadcasted by our broadcast experts and Dr. Szymanski. This already was the 3th time! Earlier as thought, some "comical" signals came back as answer. As I came back in our gathering room, Janusz Zagorski (Chef ot the FNC) had a phonecall of one of our sponsors (Internetprovider PRONET). That woman sounded very nervous, because after she came home from her visite to us, she saw all her plants including the pots they were in were broken. She also discovered some remarkable things in her cupboard, but what that was, has stayed secret for me. Jet-fighters were flying over Wylatowo. It was midnight. Again this woman called. The porter of the firm had called her to say all doors were openend, that have been closed before. A connection with that broadcasted signal of us is regarded as amazing! On the website of www.ufotv.pl actual messages are translated in English by Krzysztof Kolecki. By Ed Vos from Holland I was inspired, to make these reports and translations. He will translate them in Dutch and English, and publish them on his website www.dutchlightorbs.nl and publish them in the international discussion group, he has experience with for years. These messages will also be posted to Frank Peters, boardmember of www.fgk.org, as well as to other German researchers. I allow EVERYONE to make use of my photos as well of my texts!! From 22-07-06 there will also be an observer from the FGK, that will stay for 2 weeks. 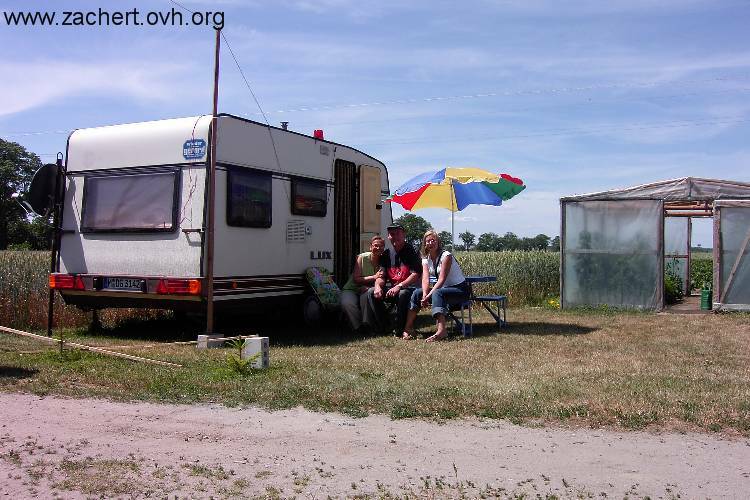 This all has become possible because of Waldemar Wawer provider from Mogilno, who connected me by cable to the from him sponsored radio Internet connection. 03-07-06 - Since a few days the broadcast equipment installed by Dr. Jan Szymanski and Roman Tabaka (Our broadcast expert) registers signals that cannot be regarded as coincidantional signals. 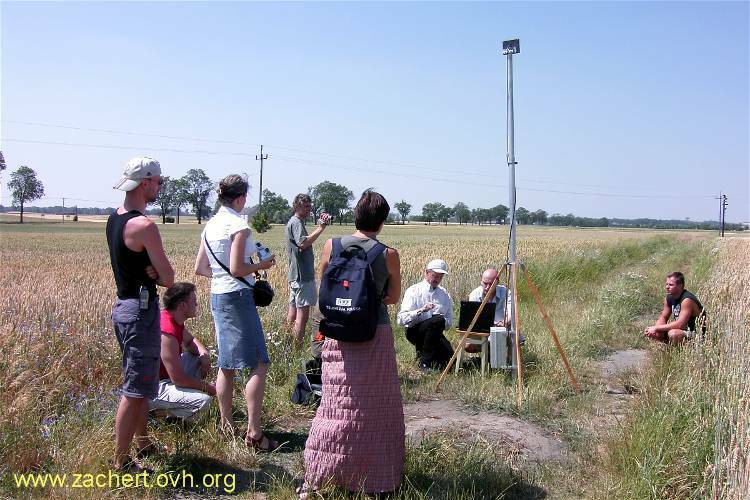 Last night (Just like last year, after which a cropcircle appeared) the Geiger Muller counter, measured a raduioactivity of zero, which is impossible in nature, because there always is a certain background radiation. Today at 17.00 (5.00 PM) there was a magnetic alsrm, caused by a strong magnetic field.